Aprons, Etc. is excited to offer an exclusive, economical option for larger quantity, dye-sublimated table cover business and I would like to introduce you to them. As the industry’s lowest priced dye-sub option, it is no longer priced out of reach for bigger orders! Limited size and color screen printing is not your only option. 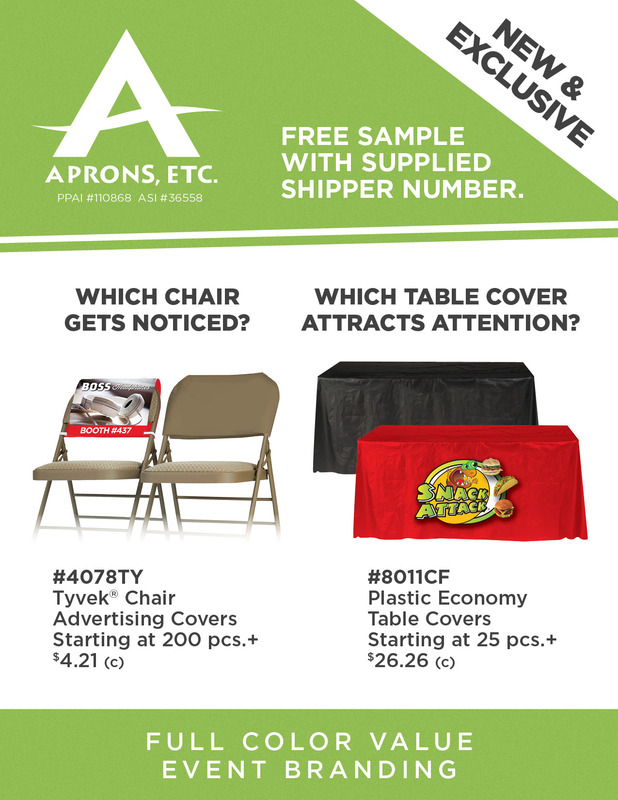 Our ValuPoly™ table covers are specifically designed to capture that large quantity, dye sublimated event marketing opportunity that has, until now, been price prohibitive for this scale of business. We want your sales staff to feel confident presenting bigger program dye sub table covers and have the edge on your competition. This is a great quality product! Please allow me to set up a conference call with your sales team to explain the benefits and advantages of this product. Exclusive Event Marketing Display Product Just Got Better! Exclusive Digital Plastic Table Covers by Aprons Etc. The Promotional Product Industry Display Exclusive Just Got Better! Industry Exclusive Disposable Plastic display logo table covers up to 60% discount off standard fabric table covers pricing now has a new exciting logo option…Digital Printing that’s right full color / photographic direct print digital logo imprinting. The most economical public branding advertising tool available now has the impact to turn heads with the Wow Factor your logo deserves. Order your FREE Sample today and start your clients event display success in 2014 at every public gathering.